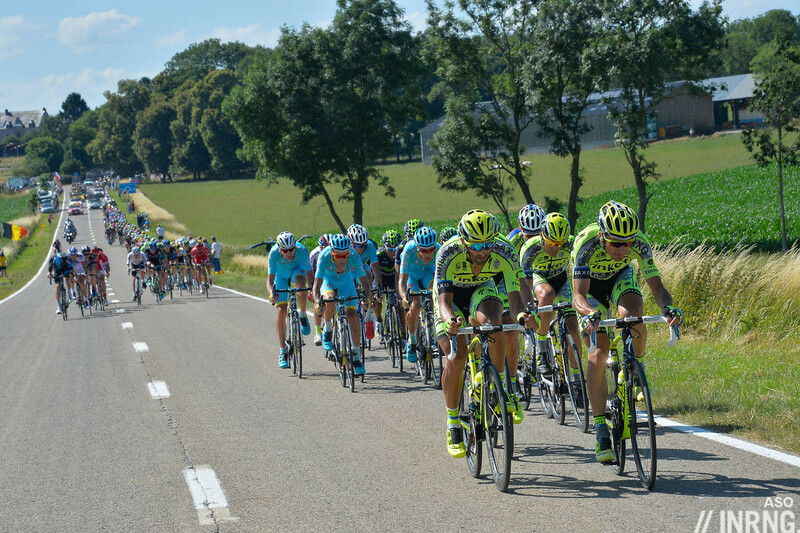 The AIOCC, the Association Internationale des Organisateurs des Courses Cyclistes, yesterday issued a press release rejecting the UCI’s proposed reforms to pro cycling following a 77 to 6 vote. Ironically the press release isn’t public but L’Equipe broke the news and German website Radsport has a good synthesis. Someone somewhere has a working copy of the UCI reforms. In recent years they’ve emerged buried in a PDF located in a dusty corner of the UCI website but these versions have been superseded by other proposals that are not public with only summary details sketched out by the occasional press release instead of a detailed masterplan to which everyone is working. Loyal readers will remember some of the older reforms, like the confusing chart above. All of this was dropped a long time ago although if these plans were once made public they were abandoned in quiet. The secrecy is part of the problem. Rather than a clear roadmap to reform which everyone is working towards the project is private. We got a press release in September but there’s been no more detail in public since. What seems to have happened is that the proposed reforms started out with general agreement but the practicalities started to pose objections. 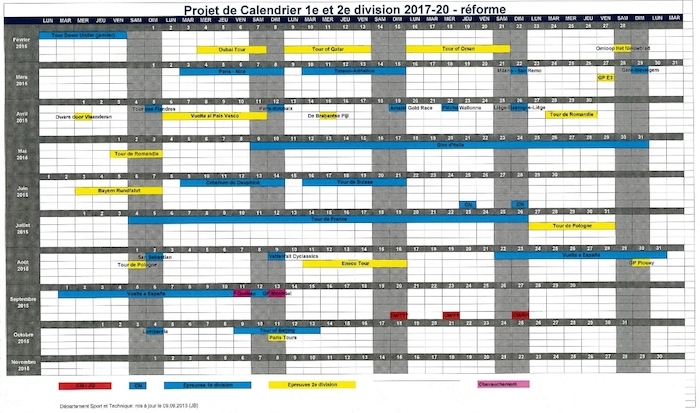 Take calendar reform, everyone agrees on the idea of World Tour races that don’t clash but squint at the proposed calendar above, look at June and see what happens to the Dauphiné and the Tour de Suisse: both shrink to six day races in order to fit into the time available in June between the Giro and the national championships. This matters because the shrunken events can’t earn as much income from host towns and a shorter race means fewer broadcast hours meaning reduced TV rights, especially if they only cover one weekend instead of the current two as the weekends bring higher audiences and a wealthier demographic. We don’t know if this particular change caused upset, but it illustrates how turning nice ideas into practical realities isn’t so easy. As we’ve seen before there’s a split with the UCI and Velon (the corporate venture owned by many World Tour teams) on one side and ASO and other, smaller, race organisers on the other. The AIOCC’s press release mimics the message of ASO that the current version of reforms have drifted too far from the original plans with implied message that the UCI has been captured by Velon. The AIOCC group comprises many race organisers and they vote according to how many events they run, for example ASO gets many votes because it runs the Tour de France, Paris-Nice, Liège-Bastogne-Liège etc, the same for RCS with the Giro, Strade Bianche and so on. The statement above seems to be a point of contention. The UCI announced new races will join the calendar but according to the Radsport piece the AIOCC members say new races should only be added to the World Tour after they’re proven for five years. This infuriates the UCI’s attempts to fast-track preferred events like the Abu Dhabi Tour. It’s an attempt by the race organisers to control the calendar, or at least set the terms of entry, something normally well beyond their role. It’s a bad idea but perhaps the race organisers probably feel that if the UCI keeps dipping its toes into race promotion, notably with Abu Dhabi, then the AIOCC wants to have a go interfering in the UCI’s role. Either way it points to the arguments. We don’t know where RCS stands in all of this? Perhaps it voted against but it has 10 races so normally it’d have 10 votes against if it felt this way. Other rejections and points of contention from the AIOCC include administrative details like the higher fees the UCI wants to levy races, an obvious area for pushback from races who will wonder what they get back in return (answer: increased anti-doping funding). Radsport also mentions a clearer system of wildcard invitations. You might remember fellow blogger Jim Ochowicz’s regular questions of how smaller teams get invites into big races (by fulfilling the UCI Pro Conti criteria and being a viable source of entertainment Jim). Now the big races seem to agree and want wildcards, or at least two of them to go to the best ranked teams in the Pro Conti ranks. That said, away from the AIOCC meeting, we should note RCS is trying to rip up the agreement that says the Coppa Italia team prize winner gets a Giro start with Mauro Vegni wanting more control over who he invites given he’s been burned time after time by doping scandals. One recurring problem is the atomistic governance of pro cycling where various groups compete rather than cooperate. You might see the UCI as the governing body but it doesn’t have a strong grip on the sport, it merely coordinates the calendar, sets the rules and supplies commissaires. Its central position is important but teams, riders, races, broadcasters and others all have different and sometimes competing interests. Besides there are divergences within these groups, for example ASO and RCS don’t always see eye to eye or take the teams where some are investors in Velon and some are not and even within Velon opinions vary. In an ideal world the UCI should be the arbitrator capable of finding a consensus, even a modest one, but September’s announcement of agreement seems to have fallen apart now. It wasn’t long ago that a raft of reforms was coming down the track but now these seem to be on hold. The uncertainty is part of the problem, nobody knows what is happening. Previously floated ideas for 2017 have been binned and now it seems the plans approved last September by the UCI’s Management Committee are now facing opposition from the races. The UCI can push on but it doesn’t control the sport and the opposing voice of the AIOCC probably requires yet more backroom discussions. Not that it’s all war and bickering, cooperation happens too. Teams will get longer licences as agreed and resolving the wildcard system is possible too. A move to smaller teams could well happen, perhaps on a trial basis first. All this and more is due for 2017 so next year’s programme of racing looks untouched. But does anyone have a vision of what the sport should look like in 2020? The picture says it all. Where are we going? Round in circles, along a barren, deserted road. I should add that I love the sport, pay to watch it in person and via a screen and I want to see the decision makers sacrifice what little they have to make things better. Fighting over scraps is madness. The root cause of all these disagreements appears to be the governing bodies somewhat flawed WT model and its insistence on following the money. Why can’t event organizers simply select the teams they feel most appropriate for their events ? The better organized and more attractive races will always rise to the top. There can never be a consensus on this matter, with so many conflicting groups and interests. The recent ‘new additions’ to the calendar have proved themselves unworthy of elevation to the group of major events on sporting let alone spectator grounds, the only justification being the state money being invested. Leaving races to pick the teams they wants affects sponsors as some want to back a team and know they’ll get to ride the Tour de France in return. Of course sponsors could hope they’re paying enough to guarantee a start but other could never be sure. So the World Tour system of meeting various criteria to get a guaranteed start has its merits. With respect INRNG. The reality is that some teams for the past few years have simply been encouraged to join the WT on the basis of empty spaces and money. Sporting merit has little to do with the inclusion of some recent teams, and everything to do with money and keeping the numbers up ! A well funded and competitive team would almost certainly be guaranteed a Tour de France ride on the basis of their sporting achievements. The present situation means that teams with zero chance of even a realistic top ten finish are guaranteed rides in the grand tours – to what sporting purpose ? Race organizers raise the finances to run their event and spend considerable time and effort to ensure everything is as well organized and as attractive as possible. I think those responsibilities alone mean they have earned the right to pick the teams that ride their races. Not unrealistic conditions placed on them by the UCI and its WT model. What’s unrealistic about the current conditions? I agree with both OJT and BC. Along with the incessant chasing of money (money which probably isn’t there), the UCI has this fixation with small things like this that don’t really matter. Meanwhile, cycling’s p1ll-popping culture (‘If it’s legal, take it’ seems to be the attitude; at best) is alive and well, with the CADF saying that 5% of riders are positive for tram*dol (675 cases), and who knows what else going on (the Russian problems could easily involve cycling and could well be just one amongst many). The UCI’s failure to deal with the dr*gs issue is causing the greatest problems within the sport – both in sporting and financial terms. That should be their absolute priority. Every time the UCI comes up with its latest plan for racing, it’s worse than what we already have. Part of the problem may be that cycling likes to compare itself with F1 whereas alpine skiing may be a better match. In F1, there is little difference between the various circuits and the abilities of the drivers, so it makes sense to have everyone competing in every race. In skiing, routes and skiiers are classified as to whether they are slalom, downhill, etc, and though it is possible to be an all rounder and there is an overall yearly title, skiiers are known by their specialities and tend to choose their races accordingly, as happens in cycling. You can also have different races happening on the same weekend, because they appeal to different skiiers. 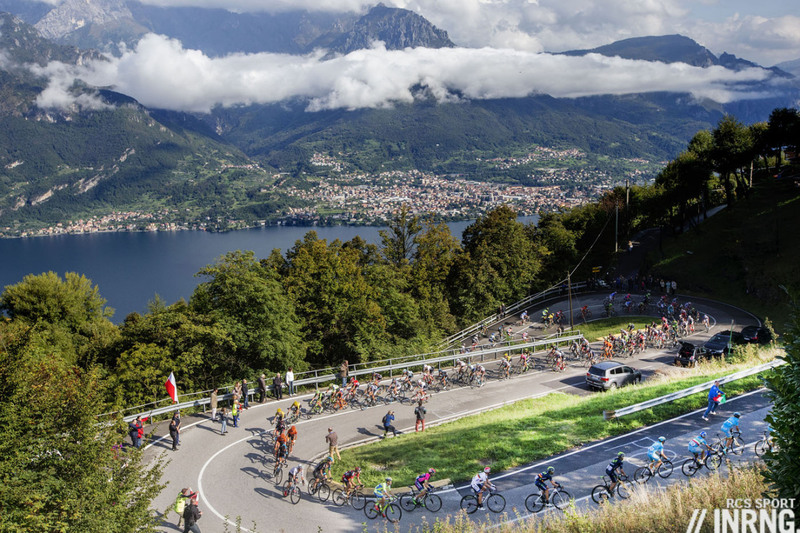 How about a system for cycling which formalises the differences between the races, so that it would be possible to have more than one WorldTour race simultaneously, provided they were of different styles – a “sprinters” race running simultaneously with a climbers race, for instance. You could have four or five classifications running all year – sprinter, time triallist, climber, Classics, stage racer, etc with an overall classification similar to that used in the Vuelta. In stage races, individual stages would have points for any category with the GC points going to the category appropriate to the race’s classification. This would enable newcomers to the sport to understand what is by nature a highly confusing calendar. I’m not saying it’s a bad idea – although I can’t see what’s wrong with just having races: why is some sort of league deemed so essential by many? – but I think it’s unlikely that that system would aid understanding for newcomers. Very rarely do I wholeheartedly agree with Uncle Oleg but his ‘a million for all three GTs’ was about right, except he should have offered a lot more money. For me, it’s great watching Froome vs Contador in Andalusia in February but in reality the biggest GT riders only ride head to head against each other at 100% for a few hours per year. They choose which races to avoid and only peak for a handful of summit finishes in July. Try explaining that to a potential sponsor. I don’t think it’s worth watering down the grand tours in order to do this, which you would have to. I can’t see how anyone would prefer to see Contador, Froome, Nibali, Quintana, et al go head-to-head in three two-week non-grand tours, rather than watch three proper grand tours through the season. Even if you kept three 3-week GTs, there has often been one dominant rider. Watching this one rider win all three GTs would be dull. 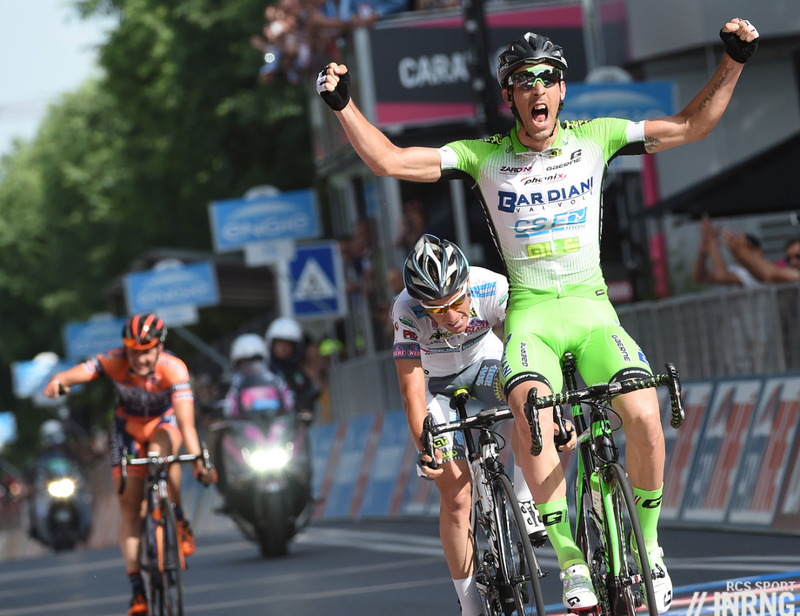 Also, all that would happen is that riders would saunter through the Giro, waiting for the Tour. How do you force them to compete? Apart from this, the money Tinkov offered was nowhere near enough for a potential TdF winner to risk that victory. The UCI need to leave well alone and ignore those whose only interest is money. There’s two schools of thought on what makes a good race. One is the best, most famous racers. The other is a well-raced competitive event with good courses. I’m in the latter camp. Some of the best races are the 2nd tier ones where riders are struggling to exploit a valued opportunity for success. I simply don’t see the need to have an all-star squad at every event. I also don’t see a problem with overlapping stage races as long as the key stages aren’t overlapping. There’s nothing wrong with some degree of regional interest. Thanks to The Inner Ring for helping decipher some of the confusion. -And the issue of tram*dol does expose it’s implications. We talk democracy, then overthrow elected governments and prop up awful regimes. Let’s discuss the actual history. I do like cutting the GT teams to 8 riders instead of 9.
on the components of the teams. as well they will have to think a bit differently when picking rider components to field, perhaps a bit more focus on either GC, stage wins, sprinting stages to the exclusion of “lets try for sprints while supporting one GC guy? Quality of the field is bound to increase, thus less chance for earlier exits due to crashing out. I still think the WT should be cut to a dozen or so top tier teams. Are there not still 17 teams “fighting” for 18 places? The race organizers could then add 4-6 “wild-card” teams at their discretion. A list of traditional events should be created and protected with any races wishing to compete during their time period reduced in UCI standing and any ratings point value. Perhaps Brian Cookson’s tenure will improve thngs, but he’s so far yet to demonstrate much long-term vision and ability to guide the sport into a successful future. I notice that the Tour of Beijing is on that 2017-2020 calendar – is that really coming back? And three Middle Eastern races are in the 2e division. Good to see that quality of racing, ethics or local interest are of no concern whatsoever. Is there any criterion for a new race reaching that level other than money? Qatar is dull when there are no crosswinds, but good when there are. Its now a well trodden step on the path of the Classics guys building up for the season. Many of then head there straight from TDU, and they really like it. Though as I said, its only really entertaining for us TV viewers when the wind is up. Oman I’ve come to like more than I used to. The Green Mountain stage is usually a good ‘un, and gets some of the big boys out to play. Abu Dhabi has been a snooze fest. But there are much better (in every way) races than all of them (however, they don’t fulfil the criterion). The best you have to say about any of them is ‘like more than I used to’. The criteria seem to vary depending on who you ask: the UCI’s criteria is ‘what can they pay’, the AIOCC’s is ‘are they already members of AIOCC’. Everyone except ASO believes that ASO takes too much money. It is (quite) profitable according to information posted on this blog. Teams are usually funded by sugar daddies or benevolent corporates. So you’ve got team owners burning cash, ASO taking it, and most riders being left with almost nothing. Admittedly you do have the problem of not being able to charge for admission and TV being expensive to produce but not much value to sell. So excuse me for being crass, but let’s think of a hypothetical scenario where we were to change the ranking systems so that instead of hypothetical “points” being up for grabs, we were simply to go to a cash leaderboard. The “league” concept would be simply based on the cash that riders have won. This would give race owners an incentive to offer as much prize money as possible, to attract the best riders, to sell the most TV rights. To acknowledge the team aspect, prize money would be directly distributed to the team, who would then determine how to split it amongst lead out riders, support riders, etc. You would need to provide surety to WT teams (however defined… perhaps about 10-12) for guaranteed entry to the commercial races that they actually want to enter (Monuments, GTs, probably not much else – sadly not TDU and Great Ocean Road), and you would also need to specify reasonable prize money for these races. Alternatively, you just squeeze the race owners by routinely tendering out the rights to run a 3 week GT in France, and call ASO’s bluff. It may support the 4 main mid east races, but to get teams over there they’d need to pay millions. But as our goal is more money into the sport this would actually be a good thing. However, you’d need to pay over the odds (again good) to get people to really unpleasant races (Beijing, Abu Dhabi, etc). Other things like team size – leave it up to race organisers. If offering 9 riders was to lead to boring races noone would do it as it would diminish their revenue. Letting the market decide this, and other aspects, would be far superior to centrally planning. UCI could quite happily sit on the outer setting minimum rules (not over the top stuff, maybe like cricket allowing races to overrule “laws” to suit local conditions), collecting licence fees from racing and otherwise just letting market based innovation lead to better wages for cyclists and more compelling racing for viewers to watch. Good stuff from down under and the Bendigo gold miner ! Even if you don’t agree with all the premises, these sort of clear thinking and original contributions are why this site is so good. Just illustrates that there are alternatives out there, if people are prepared to think outside the box. I have always been a great believer in the market making choices and decisions rather than wheeler dealing behind closed doors as is the case at present, without those involved ever having to justify reasons. If your aim is to make money, then you might achieve it. It won’t make for good racing, though – because that’s not your aim. This can be seen in all walks of life. Our politicians, and other people who benefit from it (corporations, including the media), tell us that this is the best system, but it’s not – it’s the system that makes the most money (for them). People believe the lie because it’s so all-pervasive; even though the evidence is there for all to see. Without getting bogged down with the perceived ills of Capitalism, as far as I am aware there is no known relationship between money generation and the quality of bike racing. We might even be able to afford a decent anti doping programe ! I for one don’t have a problem with the sport being financially viable and showing a positive balance sheet. We have the political power game in play at present, without the money required for the sport being generated. Remind me which company is the largest profit generator in the sport at present, and has a portfolio or major attractive bike races. You know what. You could arrange a bike race between any group of people in an event with an attractive prize list, and you would get a race ! ‘You could arrange a bike race between any group of people in an event with an attractive prize list, and you would get a race’ – Abu Dhabi? You’re right: ‘there is no known relationship between money generation and the quality of bike racing’. That’s why my point is that good racing should be the aim; not making money. I don’t intend to get into a lengthy circular discussion J Evans. Agree. Abu Dhabi is indeed more than a little dull, for reasons that are generally well known. BUT, I chose not to either watch or read about the event – no problem. Even if this is not the type of event we purists like, State sponsorship provides some welcome finance. The teams, riders and the EU organizers appear more than happy. I am not talking about making money for the sake of banking cash, although if that is a bye product, then I for one don’t have a problem. Sponsors, the Governing Body and Event Organizers are finding it increasingly difficult to generate sufficient revenue to sustain the current situation. Do we really want to risk a return to the 50s where many professional riders rode ‘a la musette’ – for winnings only. There is a strong likely hood that we are already seeing such practices return. If the sport has any hope of progressing in the long term, with a more sustainable base, then ways have to be found to generate additional revenue. My original point was that ideas outside the box, any ideas, should be welcomed if the sport is not to stagnate. To those completely bored by this discussion, I apologize and promise I won’t return on this thread ! I don’t buy all the hype about the sport being unsustainable: the people who say that seem to be using that to justify their attempts to grab more money (e.g. Velon). We’ve seen that races that are supported by the UCI solely in order to make money are not good races – Beijing and the ones in the Middle East – that’s what I’m against. The sport has survived without these ‘radical’ ideas and will do now without them – particularly if its governing body focuses on ensuring it is clean so that sponsors are not put off. There’s room for more involvement by the teams without it simply being them trying to “grab more money”. For instance, while there may be differnet views on the value of a season-long competition, there’s certainly value in having a consistent season-long narrative – a single source of information that tells you when the next race is, who’s in it, who won last time and, importantly, how you can watch it. The UCI gives you some of that info, the individual teams’ give some, and so do the races. But the only people who compile it all are fan sites like steephill and procyclingstats. I don’t see a down side in Velon, the UCI and the AIOCC getting together to organise this. Interesting idea about having a parallel TDF to compete with the traditional one. Only that it would never be allowed or made possible by the French Government, to whom Le Tour is, like defence industry, national heritage, run and owned by a private entity, for the benefit of the whole country. French national-capitalism. The country of Colbert and De Gaulle. Can you supply an example of a sport where ” just letting market based innovation lead to better wages for cyclists and more compelling racing for viewers to watch.” has worked? I admit to knowing pretty much zero about Premier League Football. Is this the sports league you’re holding up as a good example? EFB, BC and JE, lets not lose sight of the obvious economics of capitalism. Although EFB you are refreshing in your suggestions on pro cycling and making money. Remind me how much Froome or Contador make in year as salary from their benevolent corporation or sugar daddy. IMHO all the team owners need is not to chase great riders with larger pay checks for jumping to their team! I’m not talking of salary cap by any means, but teams are in many cases over priced as entertainment. I will watch competitive racing regardless of how much the riders make! I’ve been thinking about this for a few days – and INRNG’s hit the nail on the head. There’s a handful of issues with cycling’s ability to make positive changes for the sport. But, first of all, the sport is in a decent place, it’s a great spectacle for fans, and if you really know the sport most people like how the season goes through different cycles. However, in terms of strengthening the financial stability of the sport I can’t see how this will actually happen in the near future until ASO’s grasp on TV revenue is loosened up. Does anyone have an estimate on ASO’s TV revenue figures? It’s not that big, €50 million perhaps. Divide it by 22 teams and there’s not a lot to go around, even assuming the money could simply be taken from ASO and given to teams. Thanks for the extra information – and wow, that really isn’t much. I just went through that blog entry and it really hammers home the scale of the issue. Cycling’s main power entity commands annual revenue of less than $200M… that alone is the annual salary expense of approximately one major league baseball team! Thanks INRNG. What was the decision on the new point system? Why are one-day and stage races categorised equally? To draw a comparison with football – it’s like comparing a knockout cup with a league competition. Next post: What Happened to the 10 Neo-Pros to Watch for 2015?